To Transition from one thing to another simply means that something changes, evolves, as part of an ongoing process of metamorphosis. 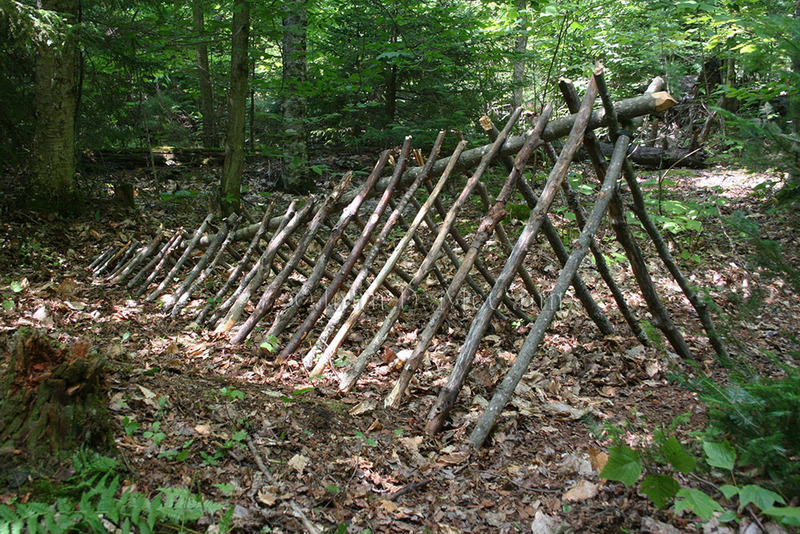 So if you imagine yourself buying a piece of land in Ontario (up north, wherever) the first step in creating a DIY Transitional Off Grid Home is to make a crude but effective survival shelter. Then you add more to it, creating a more secure structure. Then more, improving the structure's size and capabilities. Thus at each stage the home transitions, still off grid, but becoming more comfortable and expanding the homeowner's options. It doesn't have to be fancy. It could be a plowshare shelter, an A-frame shelter, something simple that allows you to stay warm and out of the elements. This structure isn't meant to be permanent, it simply has to provide shelter and warmth while you work on building something better. 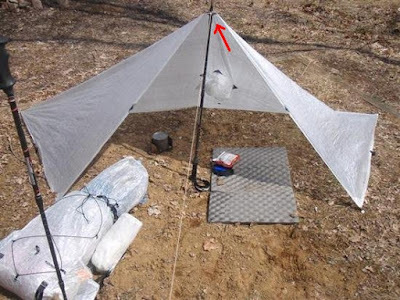 To make a plowshare shelter you will need a tarp, but the good news is it provides adequate shelter and protection from 3 angles, while still allowing the user to face their campfire and get heat from the fire. There are multiple ways to setup a plowshare shelter, so the image below is just an example. It is not the only way of creating one. The good news however is that the plowshare shelter is very easy to set up - easier than a tent as you only have to deal with one pole - and you can also skip the pole and use rope or cordage instead if there is a handy tree nearby. The A-frame shelter takes more time to build as you will typically need an axe, lots of energy, and an ample supply of trees that can be used as wood. Again, the image below is just an example of the beginning stage of an A frame shelter, and is not the only way to make one, nor is it a finished shelter. The "primitive hut*"... there are multiple ways to build huts, but generally they should take about the same time as an A-frame shelter and provide about the same amount of shelter for the time being put in. 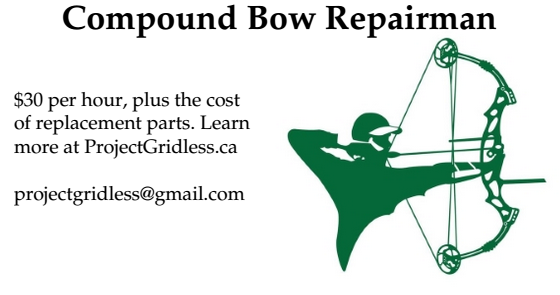 The primary difference is that huts may often require a lot more cordage to make, and depending on the design of the hut, will also require the long sticks being used to be more flexible so that they can be bent over and tied together. * So the word primitive is loaded with colonial overtones, it is effectively derogatory, and I don't like using the word here. In fact we really should be using the words "survival hut" or "temporary hut" instead. So heads up, lets stop using that word. 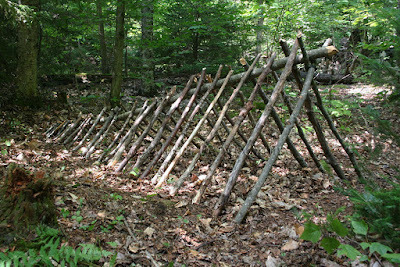 Below is an example of a temporary hut wherein the support sticks are placed around the exterior of the hut and than lashed together in the middle with cordage. Other similar designs bend the wood over and lash them together. The version below however does offer lots of height and standing room. Once the exterior is put together, the outer sections are again lashed together, this time horizontally. 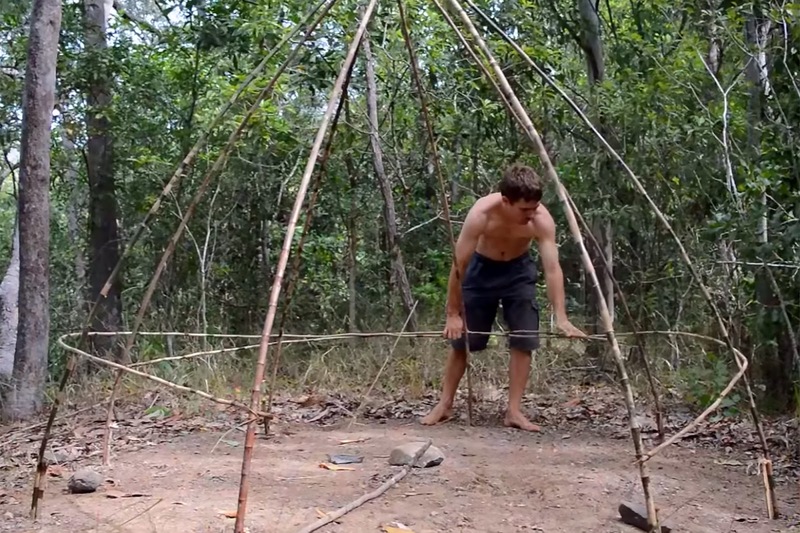 Do that multiple times to create rings around the hut, using lots of cordage. To finish the builder can then use leaves, more sticks, or even weave strips of bark together to create the outermost layer. This process is more time consuming to build, but it does offer more headroom for people who want to stand up. 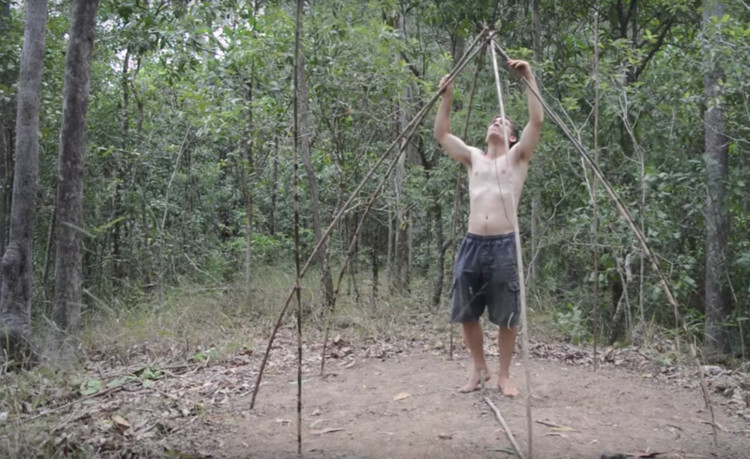 The purpose of the Survival Structure is that it is something you can build quickly, in only minutes or hours, depending on how much time and resources you have available. A yurt would be a good example of a semi-permanent structure. 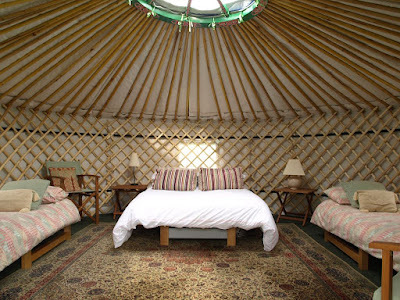 One could even conceivably just build multiple yurts that are connected and be quite comfortable. Or build larger yurts. Whichever. The above example is a 4 person yurt from Mongolia. Yurts are available in various parts of the world, but it is not too difficult to just build your own. Essentially you build a wood lattice out of long straight pieces of wood (they do not need to be flat planks) and then wrap the structure with fabric, tarp or similar materials. The yurt isn't the only semi-permanent structure a person could build. They could also build a greenhouse style structure, a shed, a cabin, or other structures that require multiple days to build. 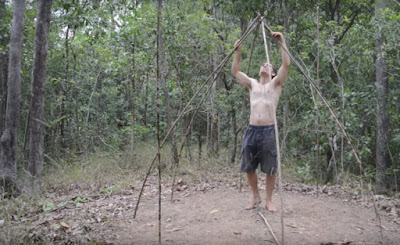 It might take days or even a week to build a semi-permanent structure, and thus having the Survival Structure available during that time period is helpful. The beauty of yurts and similar structures is that they can have a firepit, stove or similar heat source inside the structure. Thus they will be surprisingly warm, even in the winter. Because a yurt is round, the builder can also expand it over time by simply adding more lattice to the outer ring and making the ceiling bigger. Make it too big however and you may need support columns in the middle. Because a yurt can be disassembled and moved, it thus falls into the category of semi-permanent. You can try to use it as a permanent structure, but my gut tells me the owner will be moving it, having to repair it more often, disassembling it and rebuilding it, etc. It is not meant to be completely permanent. The old fashioned log cabin. The traditional longhouse, eg. Native American or Norwegian style. The standard wood, bricks and mortar home. And I am not going to bother showing photos of these because you should already be familiar with what they look like. With one exception. 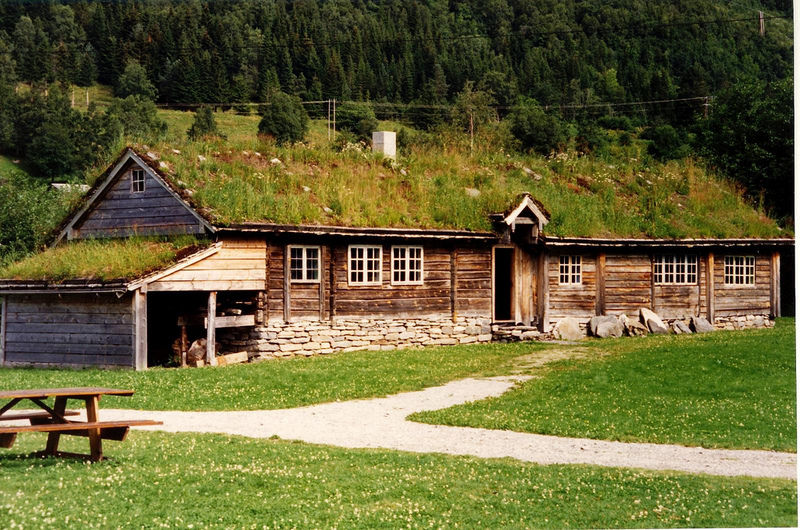 I am going to show what a traditional Norwegian longhouse looks like. The beauty of the design is that if the builder wants to expand it they can just make it longer, adding more rooms. They could even do a L shape by adding more wings. It doesn't have to be a single long building in theory. Which brings me to the last stage. Any good permanent off grid structure should have a design which makes it easy to renovate and make it bigger. Thus the builder, effectively the architect, should already be thinking about this before they first start building the first permanent structure. Adding extra rooms and space may seem like a lot more work to do, but this also allows the person to add things they really want in their home, like a more spacious bathroom, rooms for guests, rooms for relaxation, a room for storing the hot water heater, generator, battery system for solar panels, etc. They could even attach a permanent greenhouse / solarium to the house, which both provides food and heats the home during the winter. Failure to think ahead could result in a person getting stuck with a building they are not sure how to renovate and might eventually demolish rather than trying to expand it. Which to me is very wasteful.